Reference number for this case: 16-Oct-54-Chadrac. Thank you for including this reference number in any correspondence with me regarding this case. Mr. Maurice Ruant, farmer in Sinceny, close to Chauny (the Aisne) was almost the victim of the panic which the appearance of the flying saucers or other flying objects causes to some people. He was busy repairing his car, in a meadow near his home, when two gun shots were fired to his direction. The bullets crushed on the body of the vehicle, not far from his head. Mr. Maurice Ruant pressed charges and the investigation at once open made it possible to quickly find the author of the two shots, who was a neighbor to Mr. Ruant, Mr. Faisan. 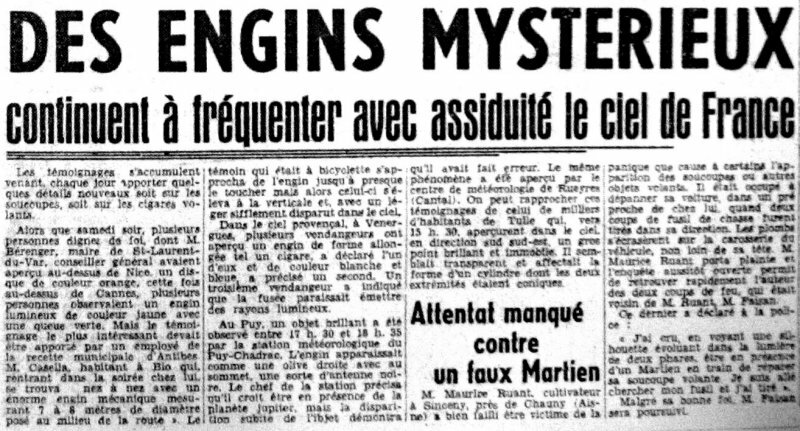 The newspaper La Montagne published this strange account in October 1954: "The weather station Albert Baldit in Chadrac (Haute-Loire) managed to observe yesterday evening from 17:50 to 18:35, with a telescope, a luminous craft which appeared as a straight olive supporting a black antenna at its top. Moreover observers noted that the object which threw fires of a very brilliant aluminium carried at its third and two thirds a black trace. The station believed to have identified at the beginning of its observations, the planet Jupiter, the largest of our solar system. But this craft which compared to north was at 100° West, changed color, with the setting sun, to become red and disappear in two minutes..." A UFO flew over Chadrac. 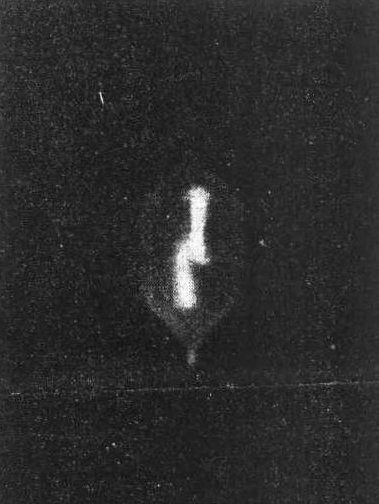 The author indicates that on October 16, 1954, the weather station of Chadrac in the Haute-Loire observed between 05:30 p.m. and 06:35 p.m. with the telescope a strange luminous craft having "the shape of a straight olive supporting at the top a black antenna". The professionals were able to observe it for a long time and found that it seemed to be in flaming aluminum, with at its two-thirds a black trace. "The station initially believed it was the planet Jupiter, but the object who was at 100° west suddenly changed color strangely to become intense red then disappeared completely. Many witnesses had observed it in several villages of the region, towards the Durande. The observatory of Rueyres in the Cantal, the employees of the EDF of Brive-la-Gaillarde in the Corrèze and the inhabitants of Brioudes in the Haute-Loire also testified to this strange phenomenon. 1.2 Patrick Gross January 27, 2017 Addition [rb1].